It empowers you to convert 4K HD videos, download YouTube videos, record screen, edit videos. 180+ formats supported, 5X faster speed. Must have video solution to convert 4K HD MKV AVI WMV MP4, etc for playback on Mac iPhone iPad Android. Download video from YouTube & 300+ sites and convert to MP4, MP3, etc. 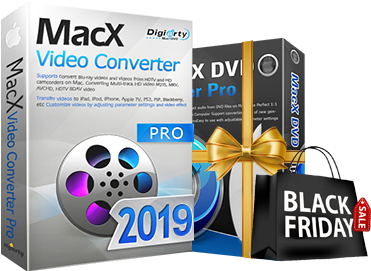 MacX Video Converter Pro - Spring Offer Enjoy time-limited 35% off discount, plus a free gift. address within minutes after you finish the payment. 30-Day money back guarantee is applied to all of our products. Lifetime free upgrade - You could upgrade the software for free. Extra discount - Additional discount on your second purchase. No.1 fast speed - Enjoy the world's fastest video conversion speed delivered by cutting-edge technology. Seamless support for the latest OS and devices, such as macOS High Sierra, iPhone 8/X, iPad Air 2 and more. You will receive your license code via email immediately after you complete the online order. For any questions regarding purchasing, please contact us at sales@macxdvd.com to get the reply within 24 hours. If you have any problems in ordering online, you may call our payment processor 2checkout for assistance. If you need multiple licenses, please contact us and we will send you the coupon. DVD Ripper Pro - No.1 fast. Backup DVD in 5 min without losing quality. Digitise DVD to MP4 H.264 MOV iOS Android, etc. Video Converter Pro - Fast video converter. Download online video. Convert it to MP4 AVI MKV MP3 AAC, etc. DVD Ripper Pro– Backup DVD in 5 min without losing quality. Digitise DVD to MP4 H.264 MOV iOS Android, etc. MediaTrans - The easiest and most powerful iPhone/iPad manager. Transfer video, photo and music between Mac and iOS.